Entry is into a high-ceilinged room with large windows on two sides and the bar in the corner. Mismatched wooden chairs stand on bare floorboards, arranged around tables with sturdy columnar candles and flower buds in little jars of water. 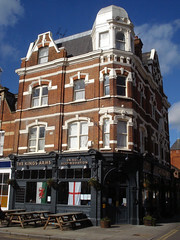 English and Welsh flags are displayed in the windows, and an inflatable rugby ball hangs from the ceiling. Another room further in provides additional seating in somewhat less well-lit conditions, and also offers access to a smaller room with a pool table. Outdoor seating is provided as a few picnic benches on the pavement out the front. Kake visited on a Friday lunchtime in February 2015. There were about a dozen people in when I arrived a little before 12:30pm, and more like two dozen by 1pm, but still a few free tables. Music was playing, not too loud. There were four real ales on: Brains Bread of Heaven, Timothy Taylor Landlord, Sharp's Doom Bar, and Mighty Oak Captain Bob. A pint of lime and soda was free! As of February 2015, Thai food is served noon-3pm and 6pm-10pm Tue-Sat, with the extra option of an all-you-can-eat buffet for £7.50 on Friday lunchtimes. Kake gave the buffet a go photo of plate, and it wasn't bad.. There were several meat dishes, plus three or four vegetarian dishes including a curry and a dish of braised beancurd puffs. The rice was a little undercooked, the pad Thai was rather too sweet for my taste, and overall the spice levels were very moderate. However, the meat was good quality, and the vegetables were very nicely judged; well seasoned and cooked to appropriate consistencies. I particularly liked the braised pork with boiled eggs. Accessibility: A small step to get in, no more than an inch. No steps to the toilets, but you need to go through two doors quite close to each other. The pool room is up one step. Last visited by Kake, February 2015. Opening hours taken from the King's Arms website, February 2015. Last edited 2015-03-01 17:33:11 (version 5; diff). List all versions. Page last edited 2015-03-01 17:33:11 (version 5).